Pop. 205. In Hilton T., Algoma Dist. on the E side ofSt. Joseph's Island on the North Channel of Lake Huron and Hwy 548, 61 km SE of Sault Ste. Marie. Pop. 53. In Plummer T., Algoma Dist., on Hwy. 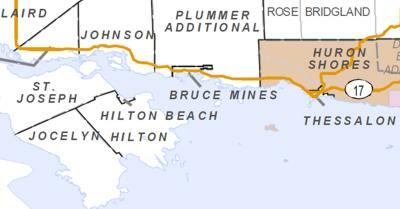 638, 3 km NE of Bruce Mines, 47 km SE of Sault Ste. 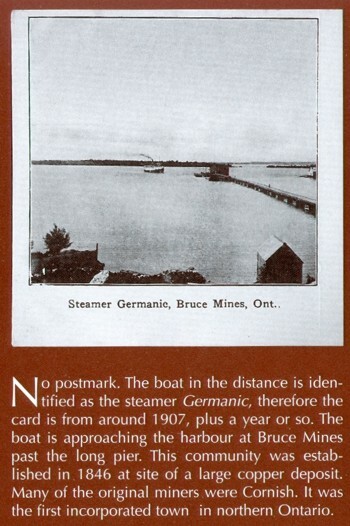 Marie, See Bruce Mines. In Aberdeen T., Algoma Dist., on C. Rd. 638, 34 km SE of Sault Ste. Marie. In Aberdeen T., Algoma Dist. on C. Rds. 638 & 670. 27 km NW of Bruce Mines, 42 km SE of Sault Ste. Marie. Pop. 38. In Plummer T., Algoma Dist. on Hwy 638, 8 km NE of Bruce Mines, 50 km. SE of Sault Ste. Marie. The place was first known as Obertail but was renamed by an early settler, Mr. Robenson, after his hometown in England. Pop. 581. In Plummer Additional T., Algoma Dist. 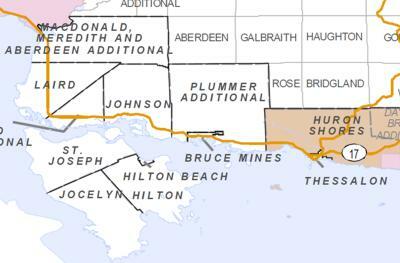 on the N shore of L. Huron's North Ch. 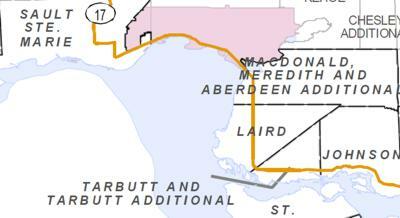 opposite St. Joseph I., on Hwys 17 & 638, 62 km SE of Sault Ste. Marie.